Your guide to exercise that feels good to you. Why You’re Here: You're looking for ways to switch up your exercise routine, or are searching for some movement and techniques that will help you in achieving specific goals. What’s Inside: Tips on how to get started moving your body and the huge health benefits. 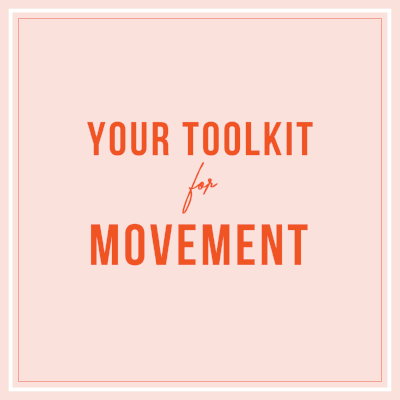 How To Use It: Use it to create a new rhythm in your life, one that believes in starting with - and frequently revisiting - the basics of movement. Some of this might feel familiar; let that be OK.
Moving our bodies is good for our health in the ways we all agree on, but it is also practice for getting to know our bodies and seeing what our bodies can do. That's a powerful experience that is valuable to working beyond our limits- whether or not our body composition ever changes. It starts with listening to our bodies and making our exercise plans based on what we need, creating movement driven by the benefits of that we feel rather than just what we see. We believe it's all about listening to the ways you move your body. That can mean moving beyond the expectations of a set plan or the latest trend, and allowing your body to have a say in what it does. If it's good for our brains, our hearts, our posture, and our physical selves then call it good. That might mean Zumba, pilates, a bike ride, yoga or even a walk around the block. Move for a few minutes. It doesn’t have to be perfect or part of a grand plan, just move your body to get out of your head and remember you can do it. Try a desk workout, walk down your street or do a quick HIIT or yoga video. Work on starting a habit by setting a goal that works in your real life and rewards the effort you put in to show up like “I’m going to move my body for 10 minutes, three times a week,every week.” Find resources to make it happen like an app (Aaptiv, Seven, YogaGlo), a workout studio (ClassPass helps you try a bunch) or a workout buddy. Remember to set yourself up for success by getting the food, water and sleep you need to keep your body moving. Pay attention to the ways regular movement makes you feel physically and emotionally. You might notice a boost in confidence, a deepened connection with your body and increased productivity. Don’t brush off those benefits! Remember them when you need motivation. I have a hard time exercising when I’m stressed. Any tips? When you’re stressed or feeling anxious, try a simple yoga flow to help cool yourself down and reconnect with your body. You can try following a set of exercises or you can simply lay down and reconnect with your body doing a body scan meditation. I just started working out and I feel like my muscles are struggling to keep up. What can I do to help take care of them so I can keep moving my body? It can be amazing when you’re new to working out because you have all these activated muscles, but you can also have very sore muscles and joints. In order to keep your body moving and taking care of yourself so you can properly heal, try incorporating foam rolling, Epsom salt baths, essential oils or stretching. I’m thinking about joining a gym or hiring a trainer. What should I look for? Any red flags? Joining a gym or hiring a trainer is a personal choice, and can sometimes be informed by your budget, lifestyle or work environment. Find out what the gym offers, do they have group fitness classes you would like to take? Do they have any amenities or special training you’re interested in? Find out how much it costs to have a trainer and find a trainer you might be interested in working with. Often, gyms will allow you to train with a trainer when you first join, so see if that is something you want to try. Watch out for red flags, including checking to make sure they have the proper credentials. Don’t ever start cold without any type of warm-up or continue training with anyone who makes you feel pain in the wrong places.